"Translation Industry 2014 Year-End Review" posted on 12/30/2014 at 11:51 PM by Matthew Bramowicz. As 2014 comes to a close, I thought I would take a look back at how the year has affected the translation industry; what has changed, what has stayed the same, and where the industry might be headed in 2015. If there’s any sort of litmus test for the direction the translation industry is headed, it’s Inc. Magazine including the translation industry among its 2014 list of best industries for starting a business. It comes as no surprise, as the Washington, D.C.-based National Council for Languages and International Studies reports that in 2014 the translation industry has grown into a 25 billion dollar enterprise in the United States alone, with estimates as high as $39 billion by the year 2018. But why does the translation industry seem to be one of the most lucrative and vertical industries at present time, given the slow economic recovery of other industries? In fact, the translation and localization industry’s growth is on a consistent path of staying ahead of the global economic growth forecasts at a rate of 5%. Perhaps the biggest factors have to do with both the expanding multicultural population and the globalization trend businesses are striving for amid the age of the internet. Since 1980, the U.S. Hispanic population has grown from 14.6 million people to nearly 52 million, per the latest Census Bureau tally. With this explosively expanding demographic, the old standby that ‘English is the official language of the US’ is becoming less and less of a true statement, especially where businesses are concerned. From a business standpoint, it makes sense to cater to a client’s native language, as research has shown that the majority of users will purchase an item or services if it is represented in their native language. Along with a greater population growth of foreign language speakers comes more need for businesses to cater not just to their perspective clients, but to their employees as well. Even at the lowest level, companies (e.g. Walmart, McDonald’s, Dunkin Donuts, etc.) need to support their employees. That means increased need for translation services for everything from employee manuals to human resource documents. Amidst the rebounding global economy, many countries that were once on the sidelines are now entering the world stage as pivotal players. BRIC countries (Brazil, Russia, India, and China) are asserting themselves more and more in today’s global economy, and as a result, this geographic shift has led to increased involvement in international legal disputes and, consequently, a much greater need for the translation industry. So now that we understand why the market for translation services is continuing to increase, let’s take a look at the trends within the industry. While these trends may be presented individually, it’s important to understand that all of these trends are not mutually exclusive, as they draw upon and affect one another equally. Translation service pricing seems to be at a constant struggle to maintain a balance between quality and affordability. As more and more businesses want to localize their content, they are reaching out to translation service providers for the first time, and many are surprised by the cost for high quality professional services. They fail to realize what it actually takes not only to translate the content, but to localize it for a particular locale and to format it (this is especially true for websites and documents that require Desktop Publishing). As a result, many companies seek out less expensive service providers and alternative methods of translation (such as machine translation). However, by doing so, they are oftentimes sacrificing quality, which they may not even be aware of until it is too late. This practice has caused a decrease in prices for translation services overall, as companies compete for business. However, this can ultimately be a cannibalistic practice as the decreased rates result in the translators needing to speed up their translation process in order to schedule more projects to maintain the same standard of living. By doing so, quality again suffers. To counter this, translation companies must convince these clients that when they’re dealing with documents that require the utmost accuracy, there can be serious repercussions for low-quality translations. Whether it’s alienating your potential clients or even potential lawsuits, as can be the case with medical devices and pharmaceuticals. The biggest alternative to professional translation services is machine translation, and the trend has continued to maintain its course through 2014. Many individuals seek out machine translation, as it is fast and free. Despite the relatively low quality results that machine translators provide, recent improvements have been made, and companies still utilize them for their speed and affordability. More and more, companies are turning to machine translation for basic content such as appliance manuals, assembly instructions, ingredient lists, etc. Perhaps the biggest trend translation companies are adopting is a push towards consolidation. “It’s happening now more than it has in the past,” Antezana states. “For some organizations, that’s their growth strategy. They’re not trying to grow by marketing.” By offering their clients a universal language package, so to speak, companies are utilizing Translation Memory more and more to store glossaries, key words, and previous translations. But that is not the only service that companies are offering. Many companies are branching out into interpreting services, voice over services, and video subtitling as well in order to cater to all of their clients’ needs. As customers also begin to demand services that traditional translation companies did not offer in the past (video interpreters who can help clients communicate with the deaf, off-site interpreters who assist with doctors’ appointments, etc. ), translation companies are evolving to become all inclusive in their services. “It’s about staying up on what the tech is and finding the best way to utilize it,” says Antezana. 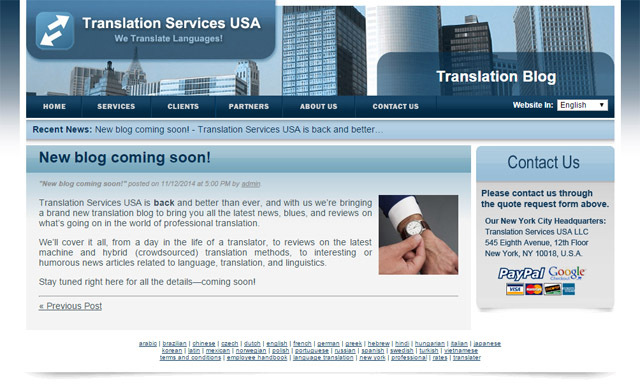 So what will be in store for the translation industry in 2015? Taking what we know from 2014, we can make some educated predictions as to what trends will be at the forefront of the translation industry in 2015. Localized content curation. Social Media Today reports that 78 percent of CMOs believe custom content is the future of marketing. Companies looking to globalize their content must continuously translate and localize their content to meet the needs of different languages and cultures. Mobile-friendly media will drive demand for spoken translation. As mobile devices and smartphones continue to become the primary go-to source for the internet and communications amongst consumers, demand for localized translations and voice-over services will increase as well. 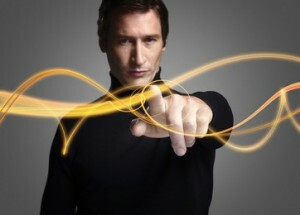 Cloud computing with marketing focused on mass personalization. With consumer behavior now being tracked and recorded in real-time, companies will continue to increase their personalized marketing campaigns. Mass personalization equates to more culture-specific messaging in local languages and dialects for global brands, and therefore, increased personalized translations.